When the world was sanctioning Iran, “the Russians kept the regime at arm’s length,” the Jerusalem Post said in an analysis on Aug. 18. Two weeks ago, the U.S. president “infuriated Defense Minister Avigdor Lieberman by saying at a Pentagon press conference that Israeli officials are now supportive of the Iran nuclear deal,” the Post said. The Israeli military and security establishment, Obama said, “acknowledges this has been a game changer,” and pointed out Israel was the country most opposed to the deal. 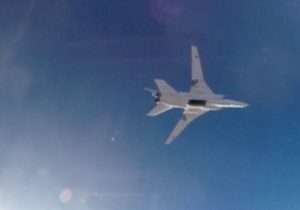 “The spectacle of Russian planes taking off from bases inside Iran … to attack targets in Syria shows, indeed, that the deal was a game changer – but not in the way Obama had in mind,” according to the analysis. Former National Security Council head Yaakov Amidror said on Israel Radio on Aug. 17 that this was not “a nice little deconfliction mechanism like the one Israel and Russia set up in September so that their pilots don’t accidentally shoot each other down over Syrian airspace. Prime Minister Benjamin Netanyahu’s “fierce opposition” to the Iranian deal “was not only based on the deal’s nuclear merits and not only motivated by fear that it would eventually give Iran a path to a nuclear bomb … his opposition also had to do with the fear that the deal would bring Iran – which had been completely isolated internationally – back into the world’s good graces and embolden it,” the Post said. “Moscow only decided to deliver the S-300 air defense missiles to Iran, a deal that had been postponed for years, after the deal was signed. From Moscow’s perspective this made perfect sense. Sanctions had been lifted, and if Iran was once again legitimate, why not go ahead and provide it with defensive arms? “Russian-Iranian military cooperation to the extent witnessed this week will have enormous significance for the Middle East,” the Post said. “It sends a clear message to the entire region not only whose side the Russians are on, but how far they are willing to go to pursue their objectives.